After an hour and a half practice session in the morning, qualifications for the ABC Supply 500 took place this afternoon at Ponoco Raceway. Josef Newgarden bested his previous high starting position (15th in 2013) and will roll off the grid 4th fortomorrow’s 500-mile race. Ed Carpenter was the first car out to qualify for the ABC Supply 500. His first lap around the tri-oval was 216.459, followed by a second lap of 216.171 in his No. 20 Fuzzy’s Vodka Chevrolet. His two-lap average of 216.315 miles per hour earned him a 21st place starting position. Newgarden was fourth out and turned laps of 219.628 and 220.665, giving him an average speed of 220.141 miles per hour. His laps in the No. 67 Hartman Oil Chevrolet provisionally placed him on the outside of Row 1. By the end of qualifications, his laps would land him the 4th starting position for tomorrow’s 500-mile race. Nicknamed “The Tricky Triangle,” Ponoco Raceway is a 2.5-mile course with only three turns. Turn 1 is modeled after New Jersey’s Trenton Speedway (closed in 1980), Turn 2 mimics the Indianapolis Motor Speedway and Turn 3 is comparable to the Milwaukee Mile. Carpenter is a two-time pole winner at IMS and Newgarden earned his first career pole position at the Milwaukee Mile in mid-July. Pocono Raceway returned to the Verizon IndyCar Series calendar in 2013, giving both Carpenter and Newgarden two starts. Newgarden holds the highest finishing position for CFH Racing with a 5th place, which he also earned in 2013. Ten drivers remain mathematically eligible for the 2015 Verizon IndyCar Series Championship, including Newgarden. The season’s final race, the GoPro Grand Prix of Sonoma, will be awarding double points. Any driver exiting Pocono Raceway within 104 points of the leader will remain in contention for the championship. Newgarden currently sits 8th in the standings with 370 points. The ABC Supply 500 will be last race of the 2015 season for team co-owner Carpenter, who only races on the oval circuits. Road and street course driver Luca Filippi will take over the No. 20 for the season’s final race at Sonoma Raceway next weekend. Newgarden, 24, is in the midst of the best season of his IndyCar career. He earned his first two wins in a span of seven races earlier in the season, captured his first career pole position and has one other podium finish. Final practice for the ABC Supply 500 will take place this evening from 5:30-6 p.m. ET. The race will be broadcast at 2 p.m. ET on NBC Sports Network on Sunday, August 23. Josef Newgarden had a tough first practice session this morning, turning only the 18th quickest lap, but bounced back to qualify 4th for tomorrow’s ABC Supply 500. 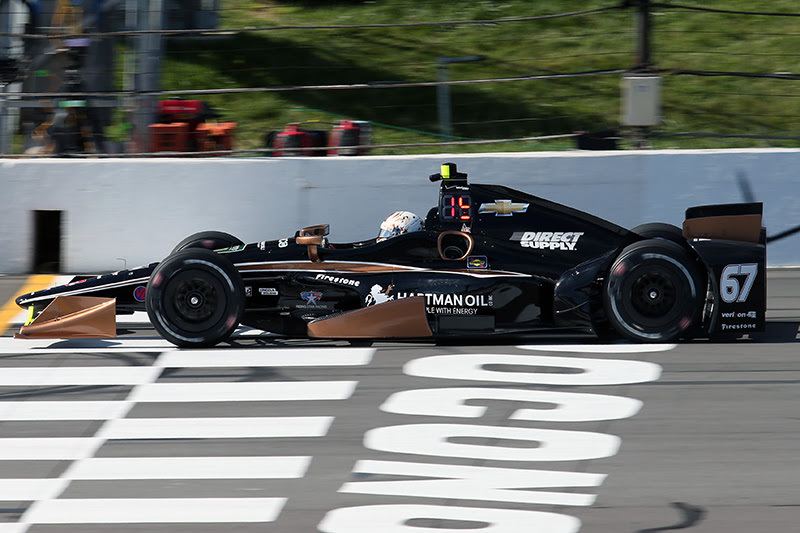 Ed Carpenter qualified 21st for tomorrow’s 500-mile race at Pocono Raceway. The ABC Supply 500 will be Carpenter’s last race of 2015 as it is the last oval event of the Verizon IndyCar Series season. 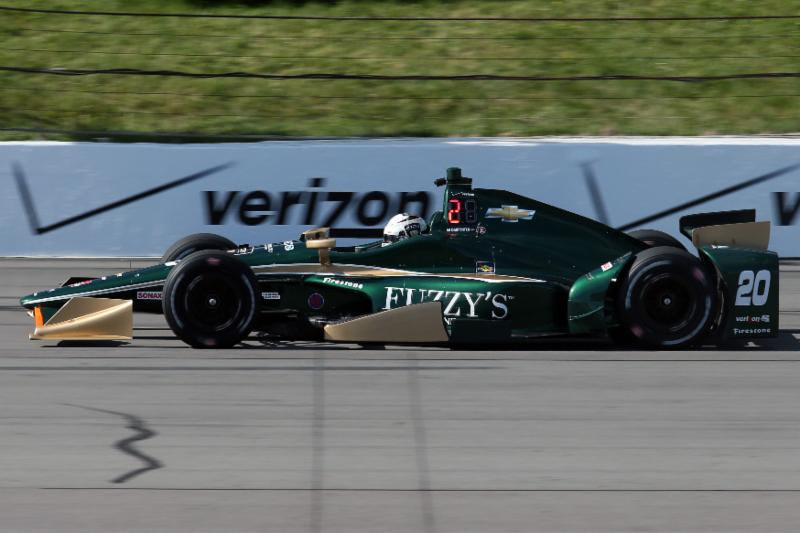 Led by co-owners Ed Carpenter, Sarah Fisher, and Wink Hartman, CFH Racing was formed in August 2014 by the integration of Ed Carpenter Racing and Sarah Fisher Hartman Racing. What is now CFH Racing has seven victories and 21 top five finishes in the past five years and earned back-to-back pole positions for the Indianapolis 500 with Carpenter in 2013 and 2014. CFH Racing competes in the 2015 Verizon IndyCar Series with two Chevrolet V6 Twin Turbos, prepared in the team’s Speedway, Ind. headquarters. Josef Newgarden pilots the No. 67 car; Carpenter is the driver of the No. 20 car for the oval events while Luca Filippi takes the wheel for the road and street course events.